​ ​ The Most Important Ingredient You and Your Partner are Missing for Doubles Success! The Most Important Ingredient You and Your Partner are Missing for Doubles Success! The other evening I watched the NCAA Basketball Championships final game between North Carolina and Gonzaga. It was obvious from the beginning of the game that each team had practiced their "plays" both offensively and defensively to the point where there was no indecision as to what they were trying to accomplish in any situation. The coaches kept a close handle on the game and the game plan at all times and reminded the players what they were trying to do during timeouts and halftime. These teams had been practicing and playing since October, working on their offense and defense against different types of styles and teams. They repeated their plays thousands of times in order to execute them well enough to be successful in the final game of the season. 1.) There is too much time spent working on strokes in a vacuum. I don't need to know how to volley, I need to know how to serve and volley, hit touch angle volleys, etc. and I need to recognize what shot to hit in what situation. We're not interested in having a stroking contest because the players who hit best DON’T win every time! We don't care how well the other team hits the ball, we are going to impose our will (and our plan) on them. 2.) Players aren't given enough credit for being smart. Too many times when we watch doubles lessons, the teacher dumbs down the concepts for the players and leaves out critical information that is necessary for success. When questioned, their response usually is something along the lines of "they're just 3.0 players, they won't understand advanced tactics." When doubles is explained properly and concisely, every student will understand it. This is critical to avoid the "everything is happening to us" syndrome. 3.) Not enough time is spent perfecting each skill and scenario until it becomes second nature. Coaches need to be able to stay the course even when the things they're teaching aren't working. It takes time, repetition and commitment to learn, understand, and be successful in implementing a plan and a style. Any time you have a team that has a plan, the ability to implement their plan consistently, and the ability to be versatile within the plan (e.g., using different returns of serve in different situations), that team will be successful against teams without a plan even if they have better skills and hit the ball better. (The only exception to this rule is when you play a team two levels or more above your level, as in an open tournament. Fortunately this is a problem most players rarely face). Remember that the average point lasts fewer than four shots. That means that you and your partner need to be rock solid on the first two balls. Serve (or return) and the next shot. That sounds simple but there are a lot of different variations that can happen so you need to play practice points over and over until you get it. 1.) 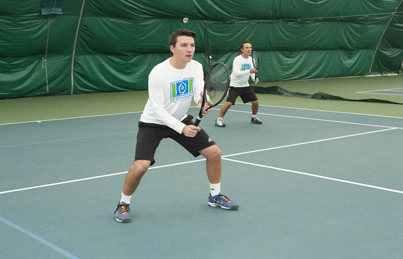 Our biggest obstacle on the tennis court is never our opponents, it's ourselves. When we execute our shots and are accurate and consistent, we won't lose to servers who stay back. 2.) In order for us to execute our "plays" instinctively and confidently, we need to repeat them until we are relaxed and confident. 3.) When one or both players divert from the plan, the result is chaos and never ends well. 4.) If we are accurate and consistent, it doesn't matter how we get the ball there, only that we do.